To reduce risk taken by people working on a roof we need to select and use the right rooftop safety equipment. For contractors and engineers accessing flat roofs to carry out essential building, repair and maintenance work, safety guardrailing afforded by collective roof edge protection system can make a major contribution to minimising danger. The collective system that is selected must meet the highest safety standards. Our KeeGuard® rooftop guardrail system is fully tested and meets or exceeds current rooftop safety requirements. Not all free standing roof edge protection systems offer this level of security of rooftop areas. The KeeGuard® roof edge protection system offers maximum flexibility for most rooftop configurations, almost any flat roof up to 10 degrees can be accommodated. The system is available for different roof types, either for use where a restraining wall such as a parapet is in place or where the rooftop is completely open around the perimeter. The KeeGuard® rooftop guardrail system can be used for retrofitting to older buildings as well as for new constructions. Kee Safety offers a full design and installation service. We can undertake surveys and produce CAD drawings for your project. If you are interested in our services, please contact us. The design of the system allows for protection of the worker while allowing snow to be shoveled over the mid rail and off the roof. Does KeeGuard need to be inspected or maintained after installation? Once properly installed, the KeeGuard system is considered a permanent installation. We recommend that any fall protection system be inspected on a routine basis for maximum liability protection for the building owner. Does the KeeGuard system comply with the current UK safety regulations? The KeeGuard system has been tested to comply with all EU norms. Each KeeGuard System is individually engineered for your premises. For further information, call 01384 632 188 to speak to our KeeGuard sales desk. 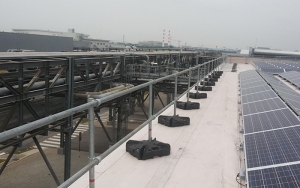 The system employs a tested and proven counterbalance system, the KeeGuard system(Patents in effect) is a roof edge railing fall protection system that keeps the workers on the roof without endangering the roof membrane itself. Galvanised, tube is used for vertical, horizontal and counterbalance supports and Kee Klamp components are all galvanized at our factory. The grub screws used to assemble the components and pipes together are all protected by Kee Koat® which is a special corrosion resistant coating. KeeGuard fall protection system is engineered using special components and is designed to withstand a full range of outdoor conditions. 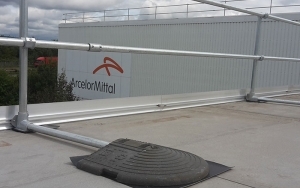 The system can be used on any style of flat roof with a slope up to 10 degrees.